I'm very proud and excited to show you this collection of wizards and magic. 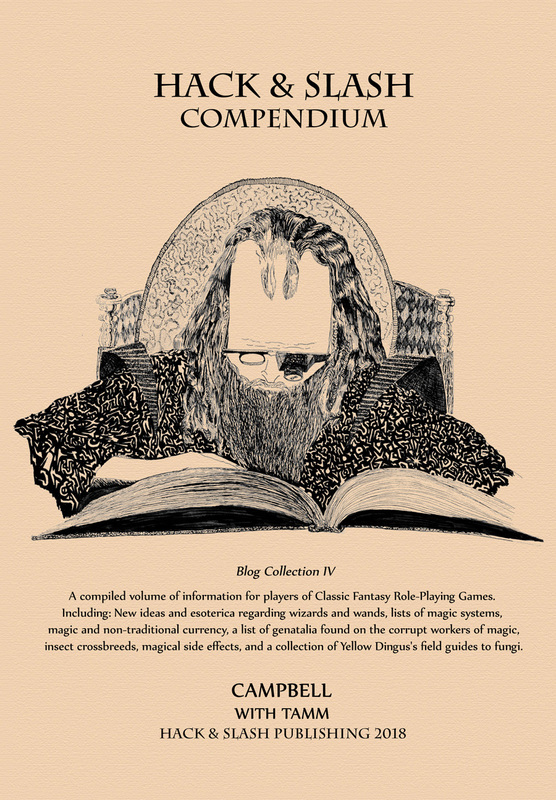 This is the fourth compendium, the others being focused on backgrounds, treasure, and classes. While this one has secrets about wizards. I even talk about how to access real magic in Dungeons and Dragons! It's Jack Chick's nightmare come true! There aren't any immediate plans to move print copies over to rpg.now; But if you want to e-mail me a lulu receipt, I'll comp you a .pdf copy. This is the fourth collected works of the Hack & Slash blog. Containing wizards and fungi! d100 Table of Wizard dicks by Chris Tamm! Types of magical and non-magical currency! Pages of magical side effects from spells! Investigations into the magical properties of dragon corpses! Information on crossbreeding your monsters with insects! Details of the panoply of wizard accoutrements. And how your campaign can let you access real magic! *rereads what Courtney actually wrote in the Jack Chick sentence* ......wait; WHAT! ?